Last week I was doing some performance tuning for a customer using Power BI on top of a large SSAS Multidimensional cube via a Live connection. 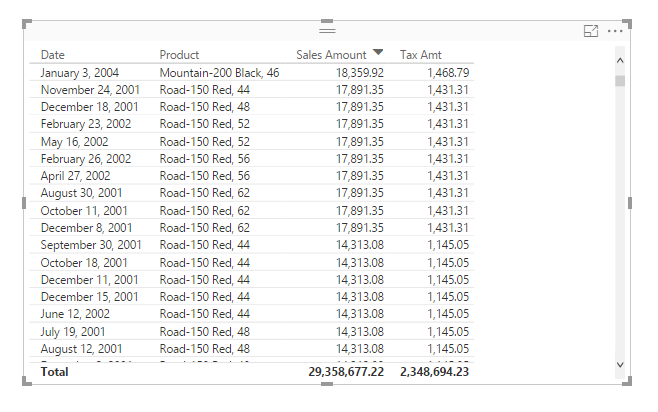 Some of their reports were performing particularly badly and I uncovered a problem with the DAX generated by Power BI for tables with a large number of rows, fields from two or more large hierarchies and totals turned on. Also look at the Duration column in the trace for these events which shows the time in milliseconds that they took to execute. 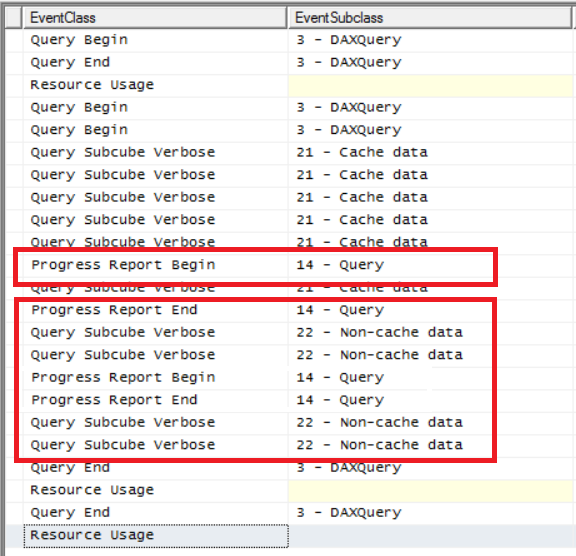 This will tell you how much of an impact this problem is having on your report refresh times. Displaying the totals in a separate table also seems to avoid the problem, although of course it doesn’t look as good. Only putting one hierarchy in the table apart from your measures, also seems to solve the problem. You could also try all the usual methods to improve SSAS performance such as building aggregations on the cube. The dev team is aware of this problem but it’s unlikely to be fixed in the short term. Thanks for the heads-up and for the profiler reminder as well, this is a good one to keep an eye on. Yikes – this is a big one w/ MD’s heavy reliance on caching for performance… which version of SSAS were you working with? 2014, but it applies to all versions of SSAS Multidimensional as far as I can see. Currently I am suffering right the same problem on one query !!! Thank you for sharing this! I was just facing the same problem on Profiler, but i did not realized that only disabling the Totals would be a workaround. It looks to be a problem related to DAX (PowerBI access MD with DAX). I am mostly using the SSAS MD, but I have a similar model with Tabular and the problem there is quite the same. I also tested with a similar table in Excel accessing the MD model with MDX without any problem. *Tested on SQL Server 2016 SP1 and SQL Server 2017 CTP2. Does anybody know if there is any update from Microsoft on that? I have tested this against SQL 2017 Standard and SQL 2017 Enterprise and Enterprise doesn’t exhibit the problem in my case. We are licensed for Standard and don’t have a viable work around at this point. I just wanted to ask you, Chris – did you see this behavior on SQL Standard or SQL Enterprise editions? We thought it was related to the partitioning capability of the Enterprise edition of SQL, but could it be a bug in power bi when run against SQL Standard edition? I would be *very* surprised if this was a Standard/Enterprise problem. Did you have exactly the same data and database in both cases? The problem is related to the amount of data returned by the query and the way the MDX query is written, and how it impacts the way SSAS does caching; it should behave in the same way on Standard and Enterprise Edition. I am facing the same situation with SSAS 13.0.5149.0, but not with SSAS 12.0.200.8, it is strange. When using a Power BI / matrix visual on the 2014 version the report runs in seconds, when against SQL 2016 I’m facing what you have posted here. Both servers have similarity on configuration. both QRY on tracers runs 200 milliseconds apart, but on the SQL 2016 drags all the memory and app and server crashed. Any comment here?? It’s hard to say, I’m afraid. Do both instances have exactly the same database/data on them? Yes, the database and data are exactly the same except for the version of SQL (2017 Standard vs. 2017 Enterprise). I have a case open up with Power BI and hopefully they can try and repro. I did see on a SQL Profiler trace that Enterprise was indeed making several partitioned reads of the data but your article here has me confused because removing the grand total against Standard did alleviate the problem. If you do hear something back from your support case, please let me know. Performance will be better on an Enterprise Edition server because SSAS will read data from multiple partitions in parallel, but I would be surprised if caching behaved differently on Enterprise Edition and Standard Edition. For it is worth, I am getting the same performance problem with SSAS 2016 SP2, CU3. My performance testing was with Excel 2010 which was OK (5 – 15 seconds) Vs Power BI for same and similar reports of at least 2 minutes but commonly the queries never finished. The cube already has more aggregations than I would normally use (to mitigate reported performance issues), as many attribute relationships as I could define and many hierarchies. 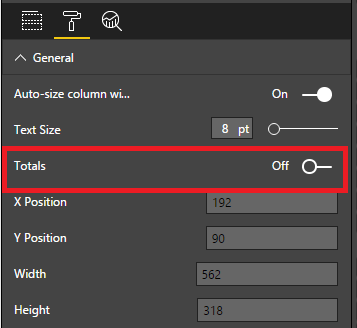 Changing the Power BI table so that totals were turned off fixed the issue. With numerous reports from our users from various different cubes and reports (Power BI included), I will be following this one up on Monday morning. Thanks heaps to Chris for publishing.